The client is an IoT connection provider offering internet connectivity for any smart product, automatically and securely, right out of the box. Cirrent provides a global network of ZipKey Wi-Fi hotspots for connected products through partnerships with ISPs, Wi-Fi onboarding, product lifecycle management, and tools for ongoing support and Cirrent’s Wireless Connection Manager. Cirrent’s mission is to make Internet-connected products simple and secure for mainstream consumers, and to make it easy for companies to add value by connecting their products to the Internet. Customers of Cirrent include Electrolux, Smanos, Bose , Ayla Networks, and more. The client required the creation of a wireless configuration manager application that resolved such problems so that a user only has to plug in a device and wait for a few seconds for the device to connect automatically. The solution should be easily-installable and should establish a secure connection outside of the customer’s private network. Moreover, the client’s main goal was to create a system which would provide full-product lifecycle management and tools for ongoing support for any device. 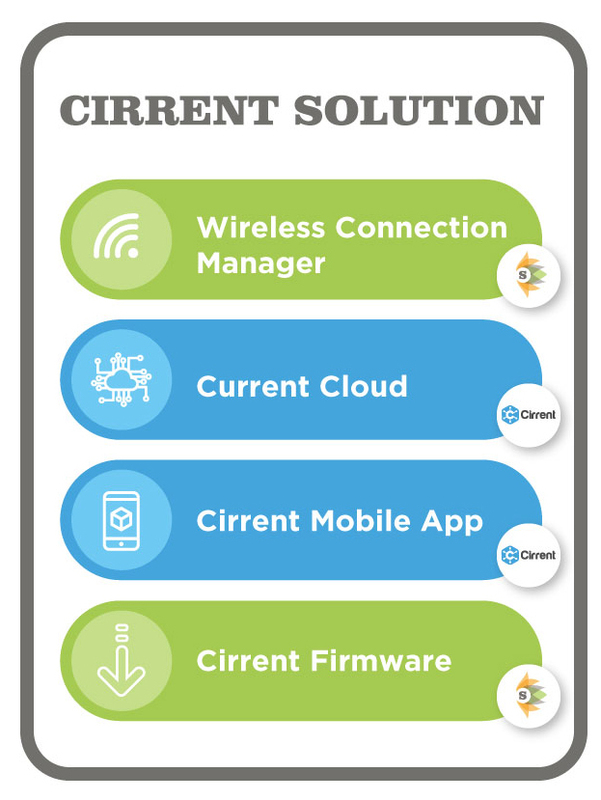 Our team contributed to the design and implementation of the Cirrent Wireless Connection Manager (WCM). The WCM helps devices connect instantly with no setup and no password, but with strong security. We created a robust, embedded, Linux-based software system that can be ported on an embedded platform with minimal effort, and that satisfies the time and memory constraints of current hardware from major vendors. The solution created a global network, in public spaces and homes across the world, designed to get instant cloud connection and product registration using Cirrent WCM. With Cirrent WCM, devices have the ability to access public Wi-Fi networks and get limited access to the internet (up to 10 kbit/sec). When a customer changes his or her network password the product will still be online. Moreover, WCM doesn’t need any hardware or proprietary software, it can be integrated into existing product lines at very little cost. We have integrated an installation package of WCM in the common build process for OpenWRT platforms and as a result, there is ready-to-use firmware which can be flashed into device directly or using OTA update.. Designing the same solution for RTOS platforms is planned in the next release, but for now, we provide a collected library which can be integrated into standard SDK for target platforms. Wireless Connection Manager protects customers, featuring encryption, certificates, and authentication. WCM is a robust Linux-embedded software that is fully maintainable over the long term and can be adjusted for different platforms so companies can instead focus on the breakthrough features for their products. WCM solution is compatible with all of the leading Wi-Fi chipsets, Linux, and real-time operating systems. WCM includes support not only for products with ZipKey but for products without this technology and allows a full connected product lifecycle for them too. With our solution, manufacturers can make better products and reduce costs, while consumers get a much better user experience. Automated functional and integration tests were created that validate the current version of the software and simplify porting of the system onto other platforms.